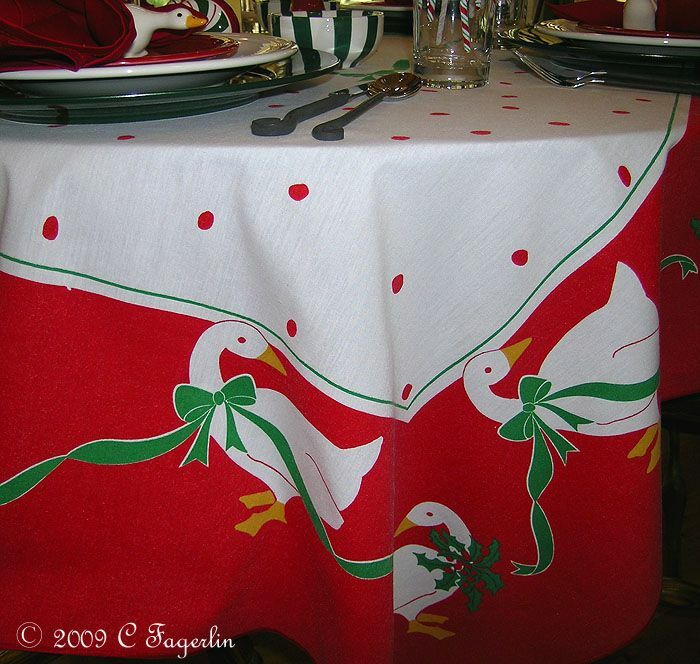 This vintage tablecloth seems out of character for Vera's tablecloths, but it is indeed a Vera with the typical Christmas geese so popular in the '80s. 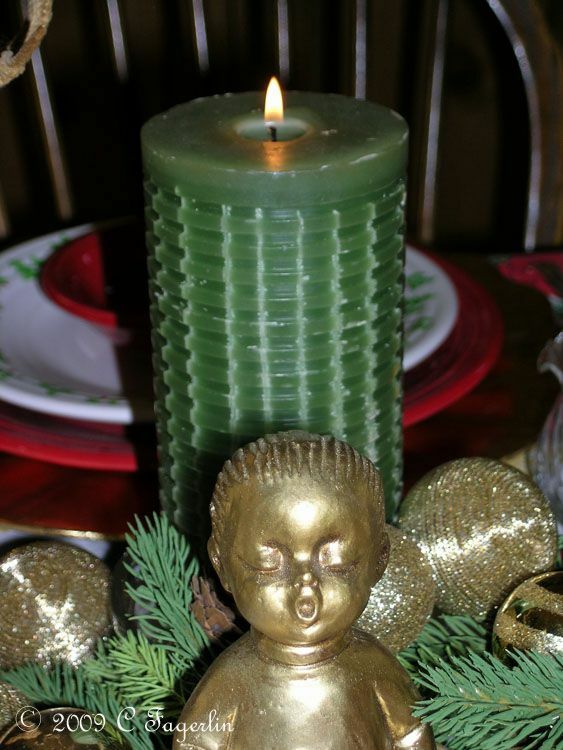 I've never made a Christmas goose, perhaps this is the year to give it a try! 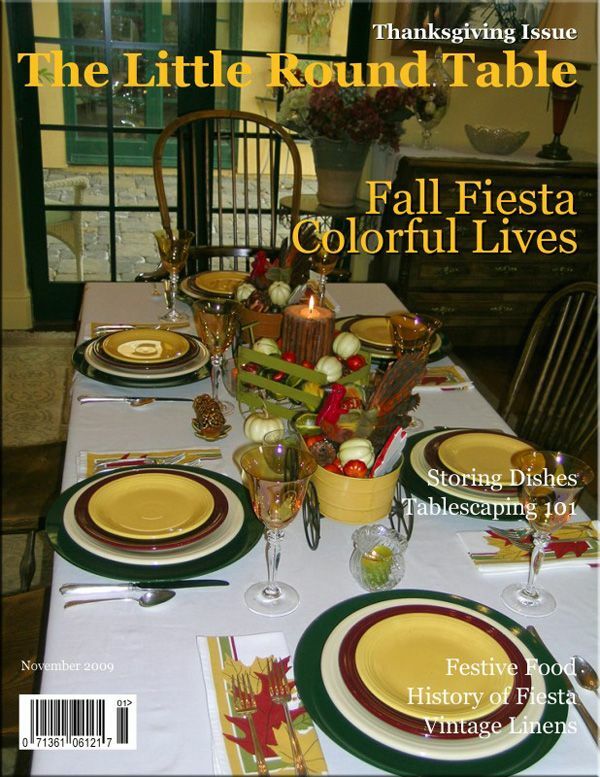 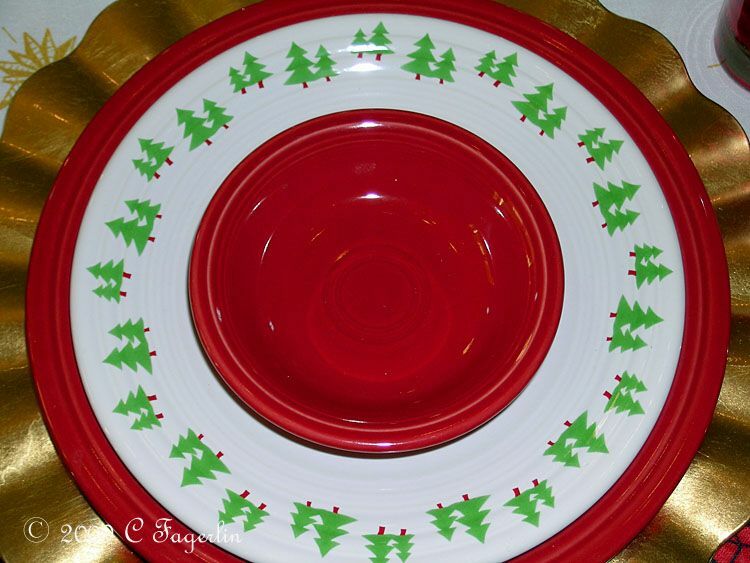 Hunter green chargers, White Post 86 Fiesta dinner plates, Scarlet Fiesta salad plates. 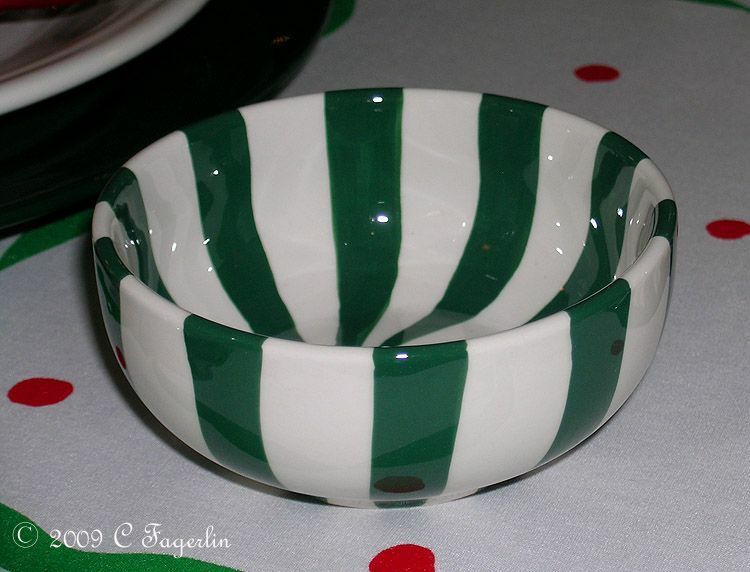 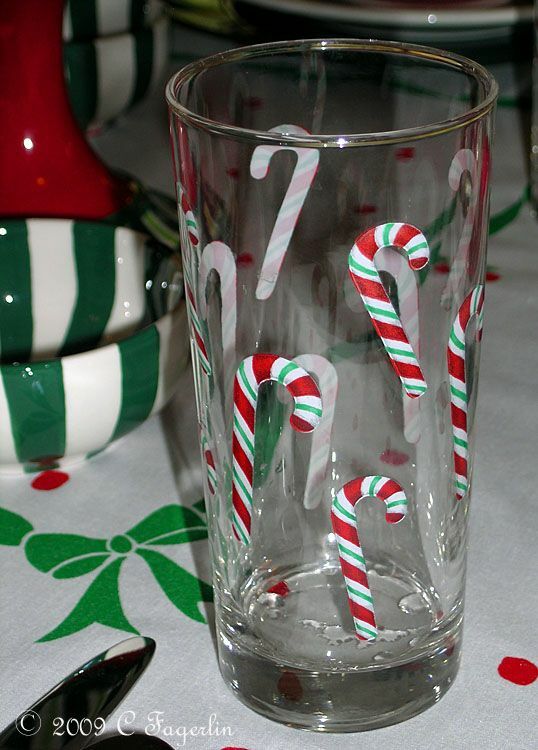 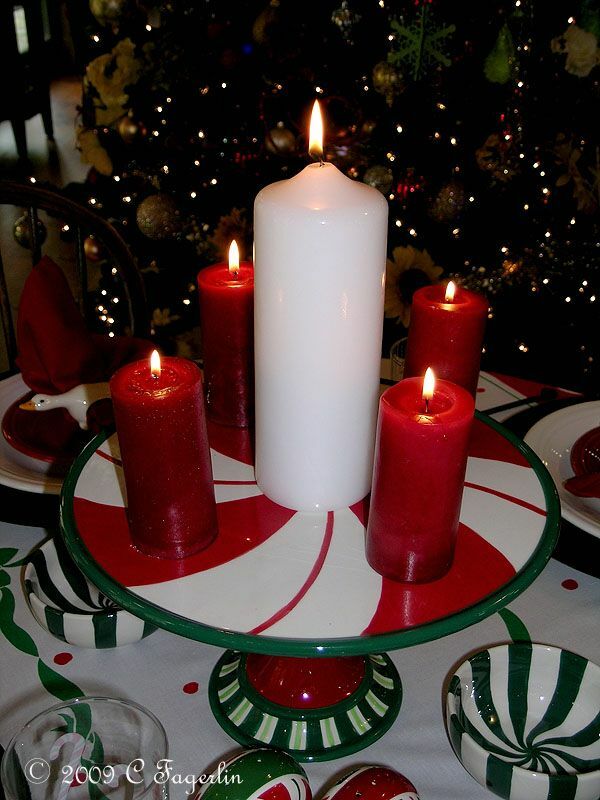 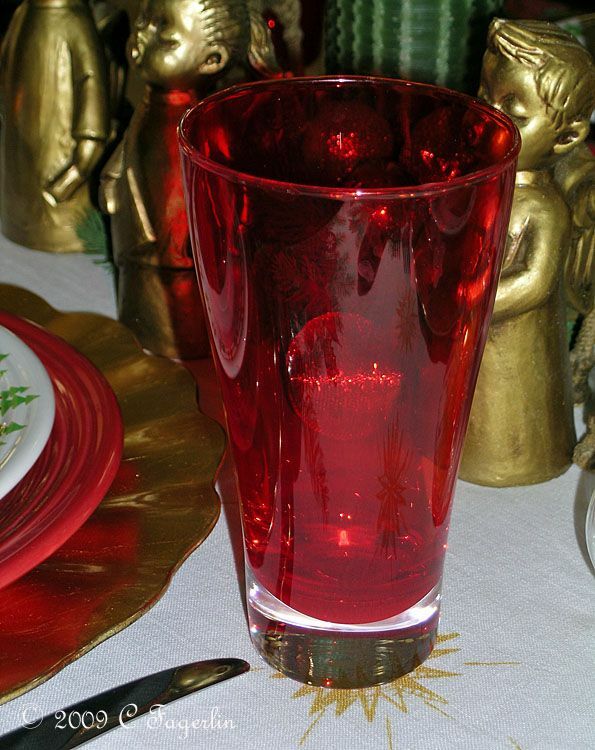 Candy cane glassware is from Pfaltzgraff, flatware from Home Goods, salt and pepper and peppermint bowl from Pier 1. 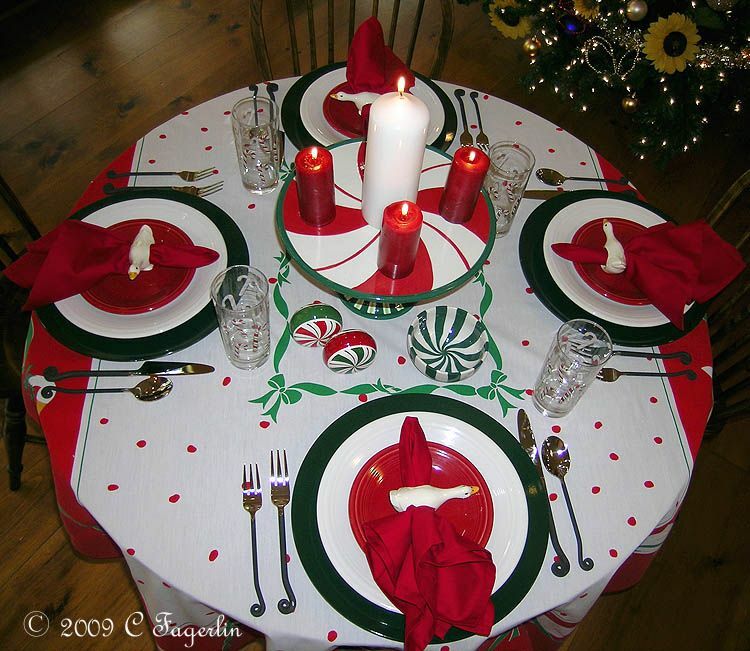 The cake stand is Fitz and Floyd, napkins from Tuesday Morning. 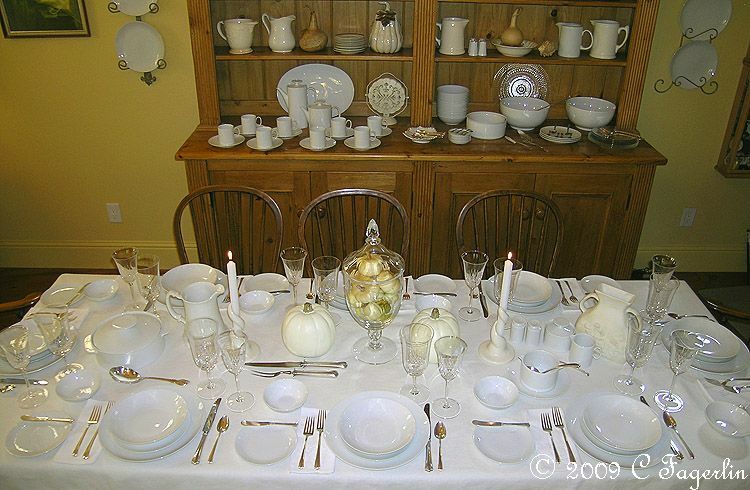 After doing some research on the roasting of a goose, I think I will wait for a less visible dinner party to make my first goose. 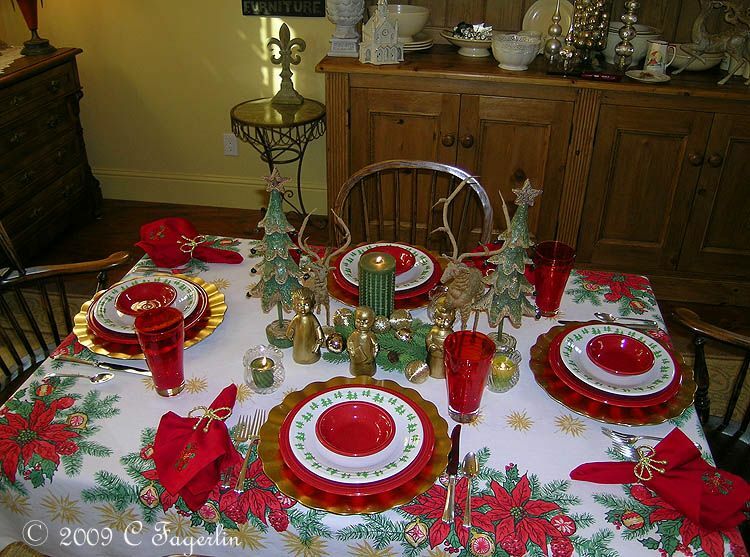 It would take 4 geese to feed our Christmas dinner crowd! 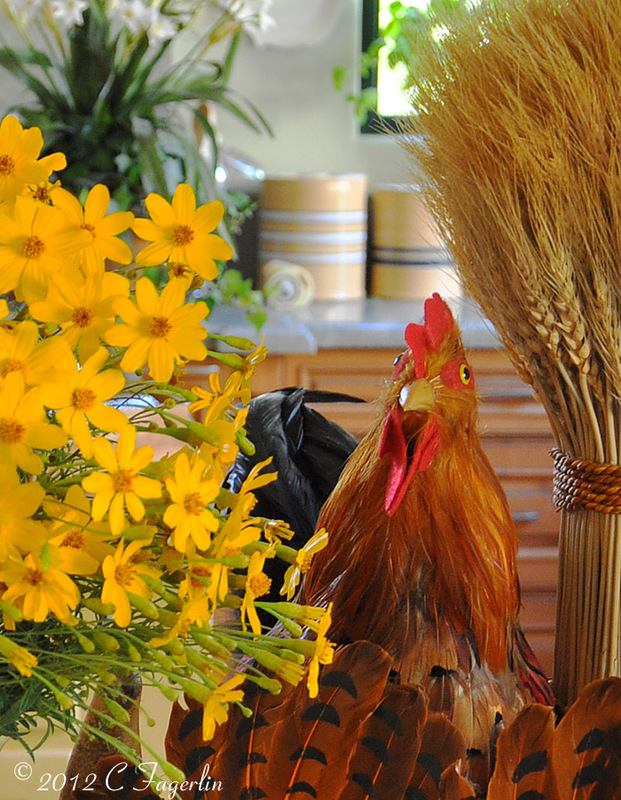 Apparently the bigger the goose the less likely you will end up with a tender result. 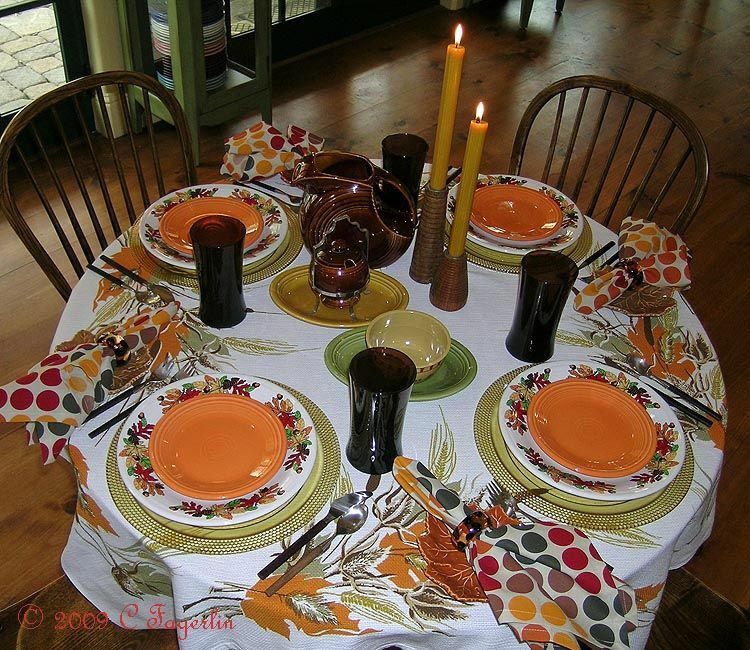 Small 8-12 pound geese are the recommended size to roast. 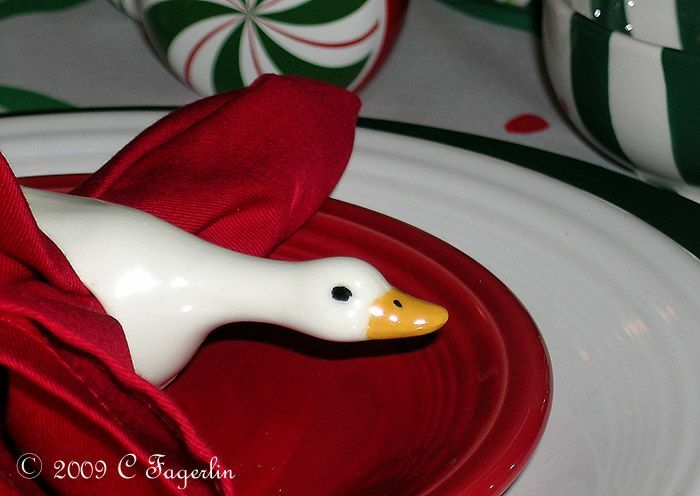 So I will have to wait to "cook my goose" ....have you ever wondered where that expression came from? 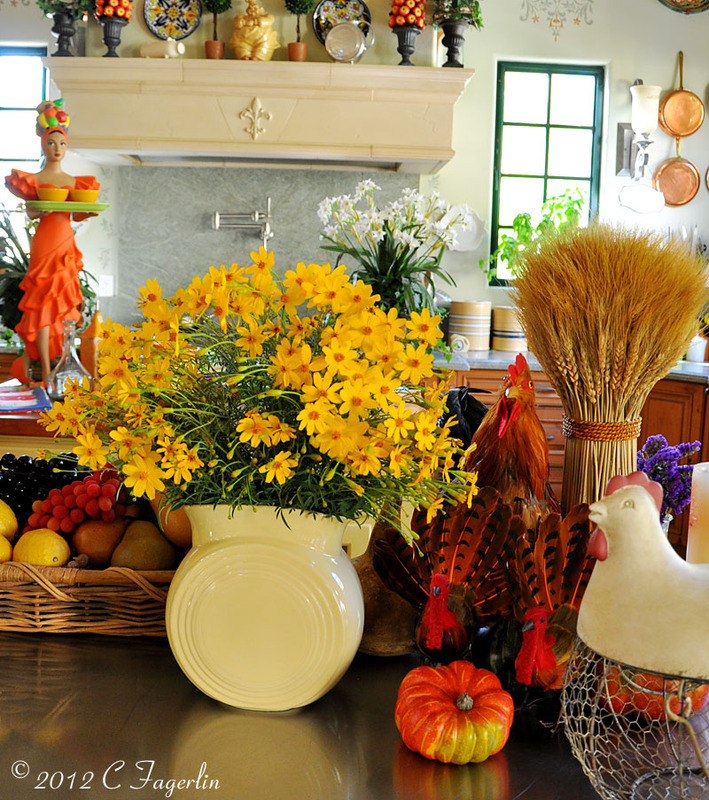 I will admit that at this early hour of the morning I can just about taste the wonderful dark full flavored goose that is in my future. 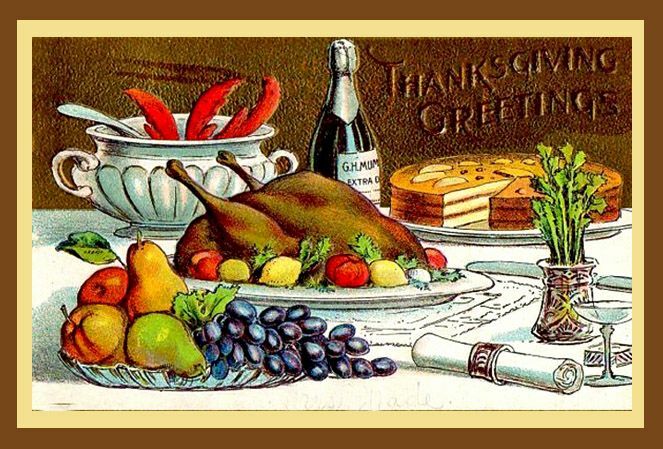 And apple plus plum stuffing or sausage stuffing ..... sounds like heaven! 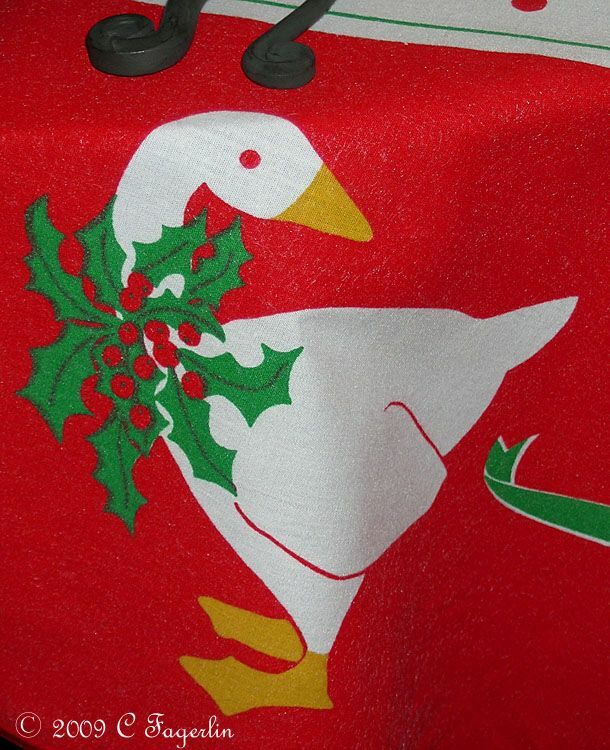 There is a goose in my future, just not for Christmas dinner this year. 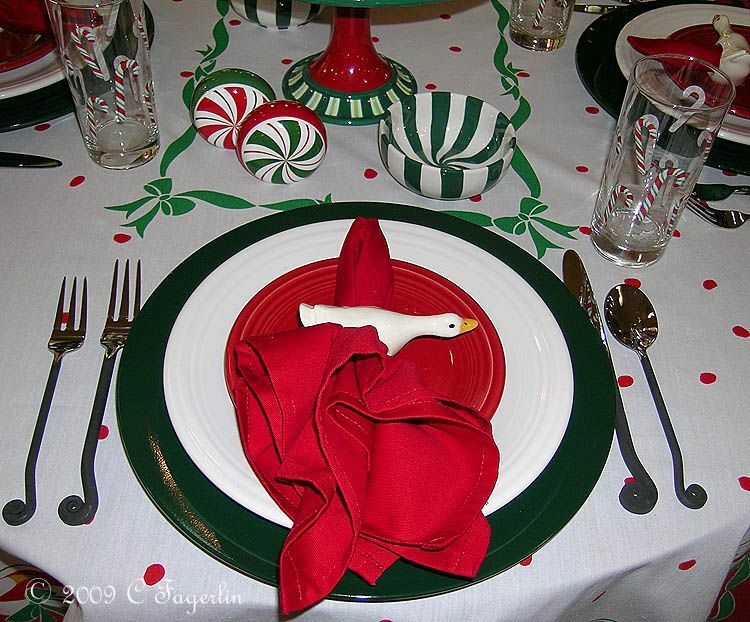 Have a merry old time whatever you serve up on your table. 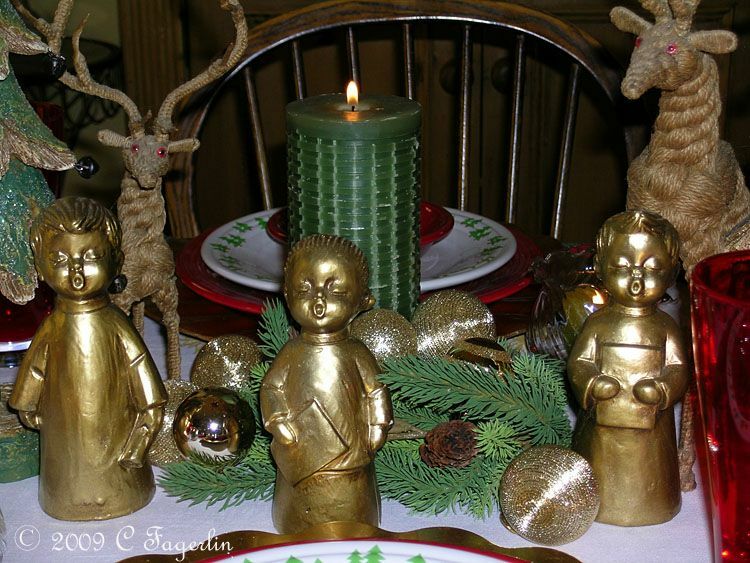 These little carollers have been around for our Christmas celebrations for about 40 years. 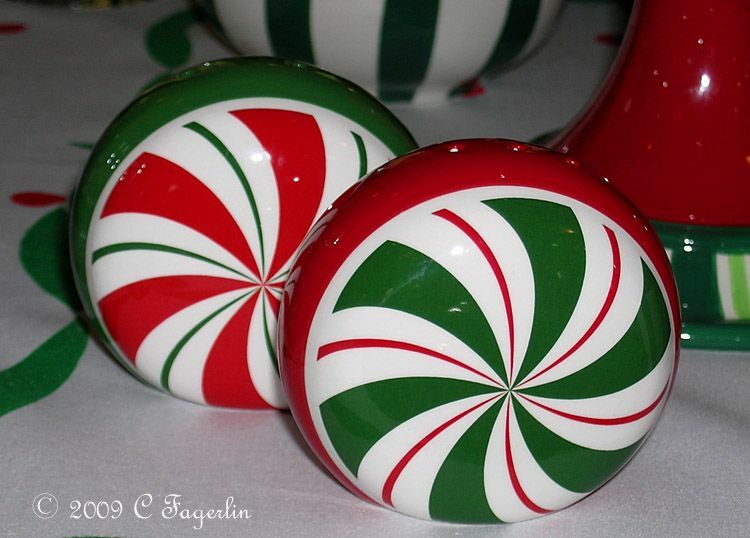 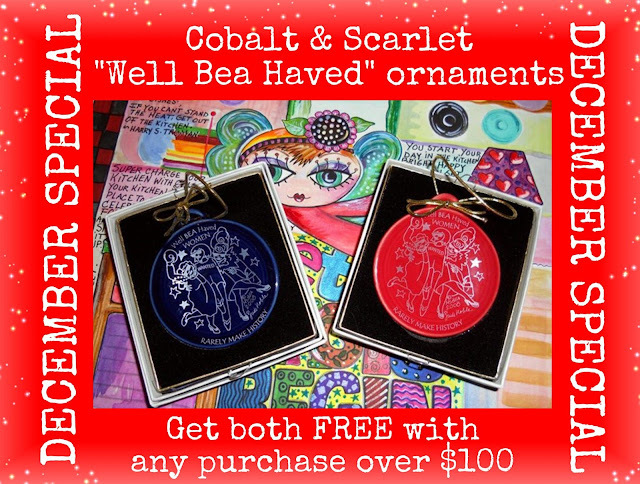 Bought them on sale at a place on Watt Avenue in Sacramento for our first Christmas in California. 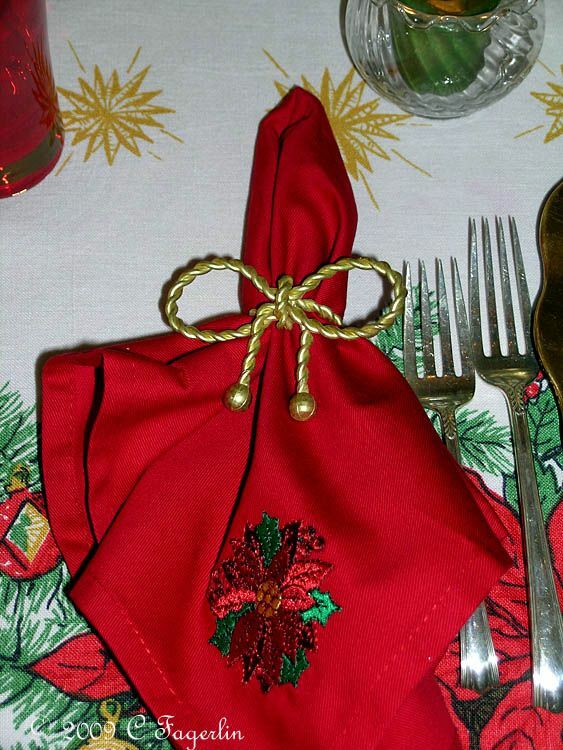 The deer have been around almost as long and are made from hemp type rope over some sort of wire frame. 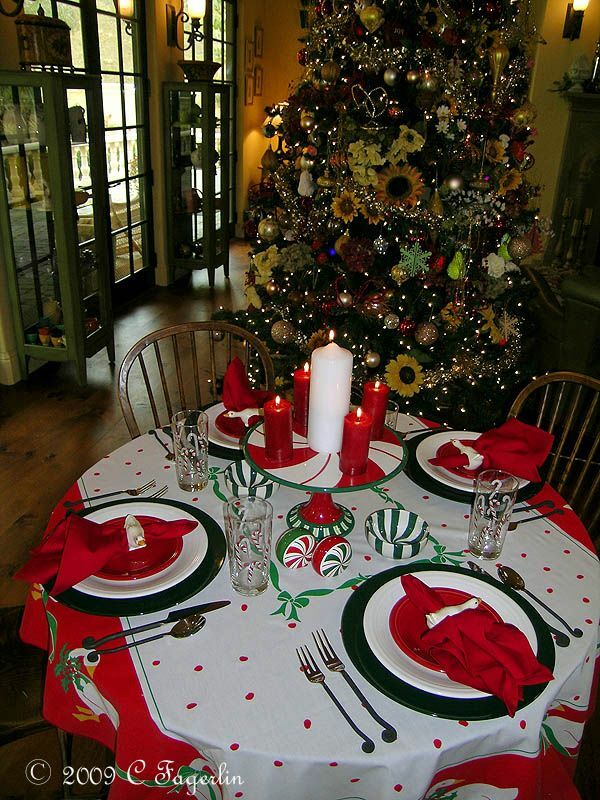 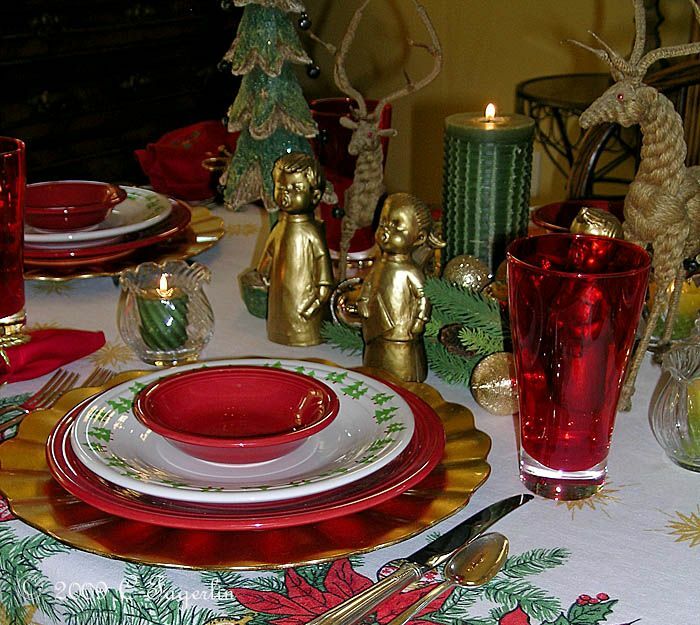 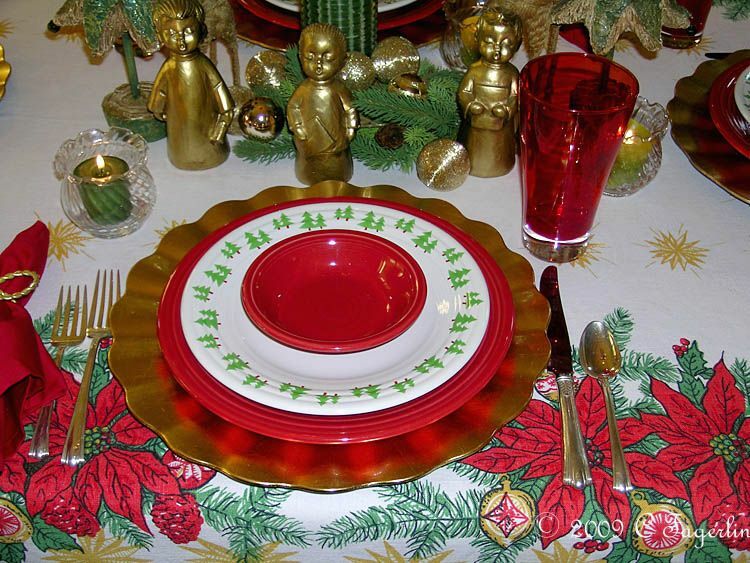 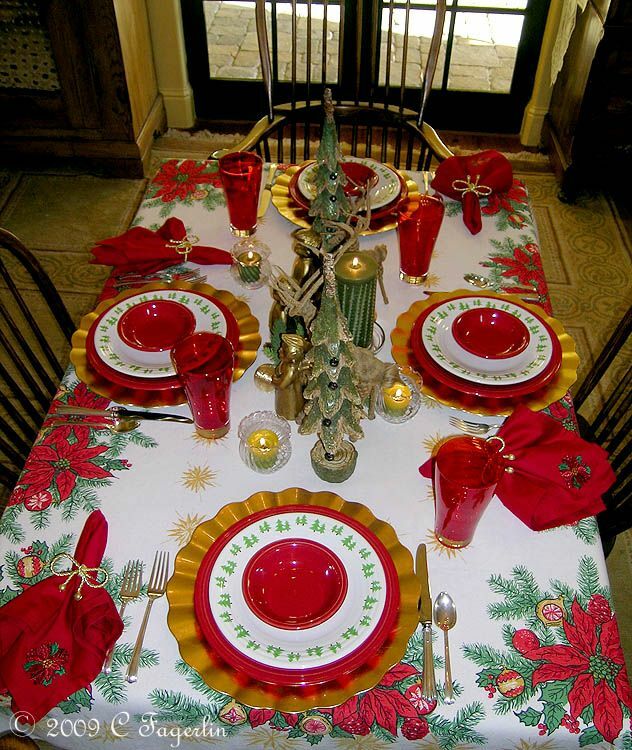 Vintage tablecloth with gold chargers, Scarlet Post 86 Fiesta dinner plates and White Fiesta luncheon plates with the green Christmas tree decal and Scarlet berry bowls. 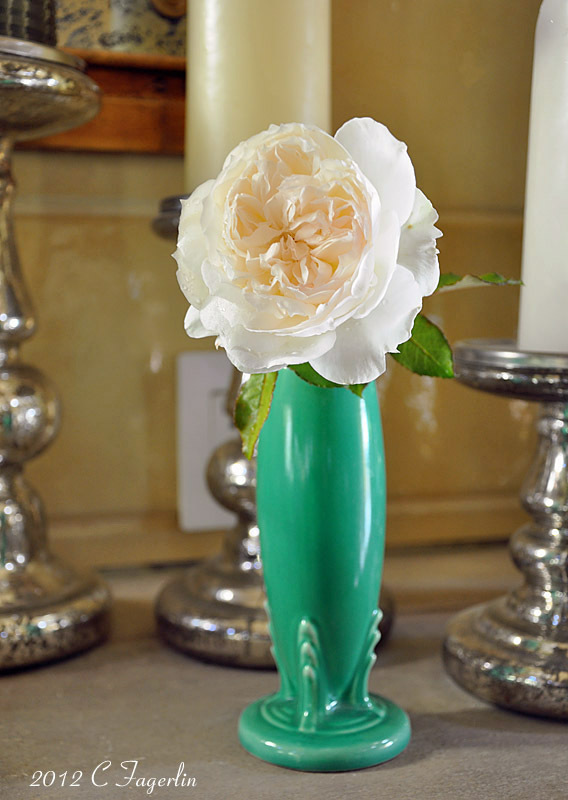 The sterling is American Directoire. 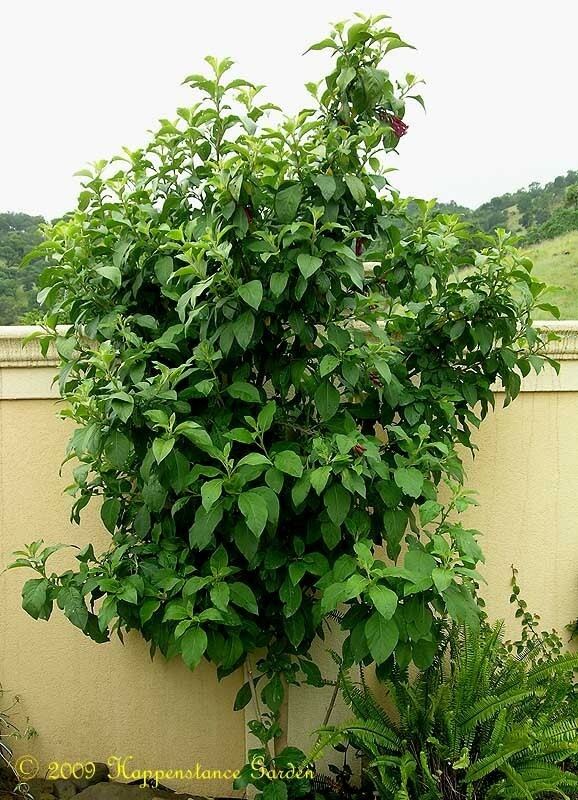 Iochroma is a genus of about 34 species of shrubs and small trees found in the forests of South America. 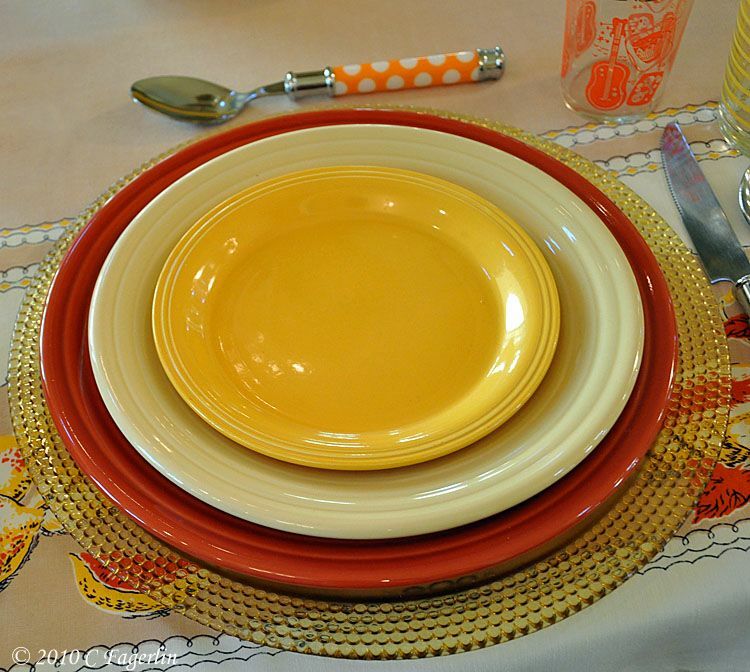 They range from Colombia to Argentina. 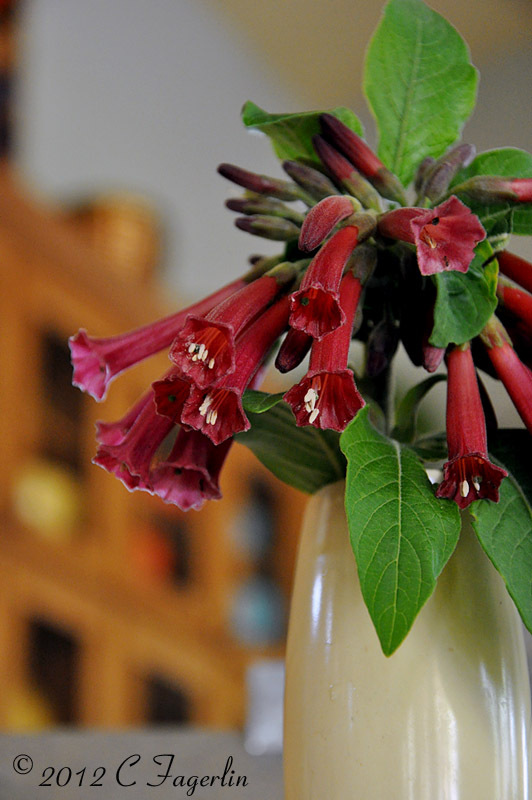 Their hummingbird pollinated flowers are tubular or trumpet-shaped, and may be blue, purple, red, yellow, or white, becoming pulpy berries. 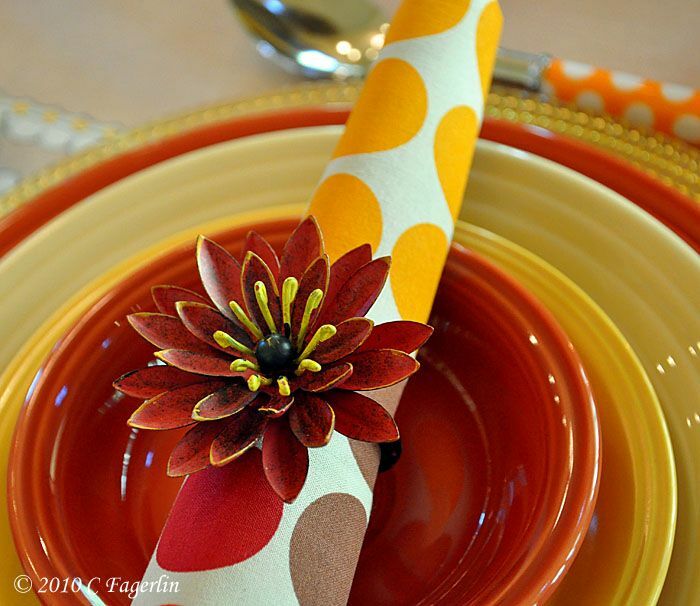 Marigold that reseeds freely and is extremely aromatic. 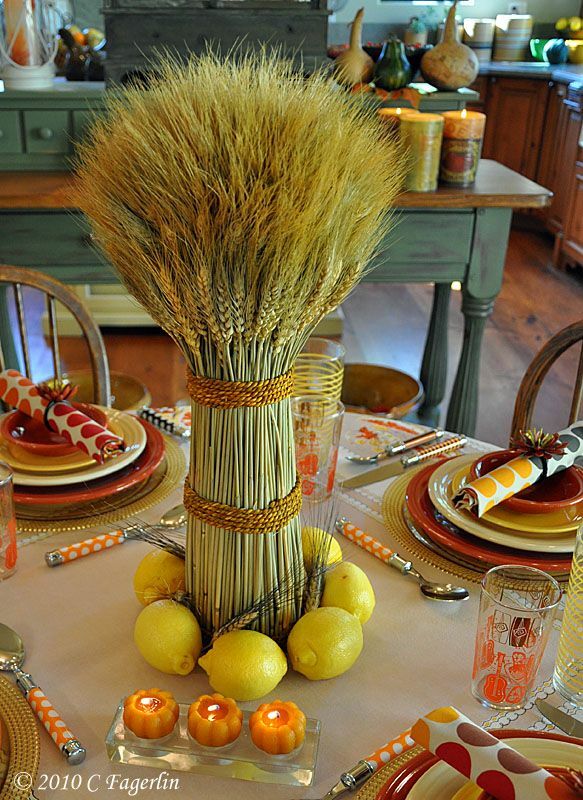 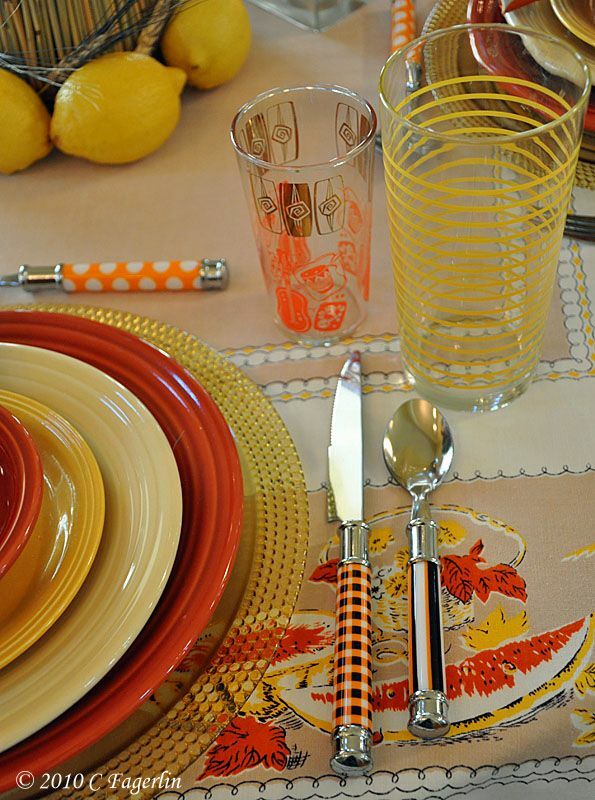 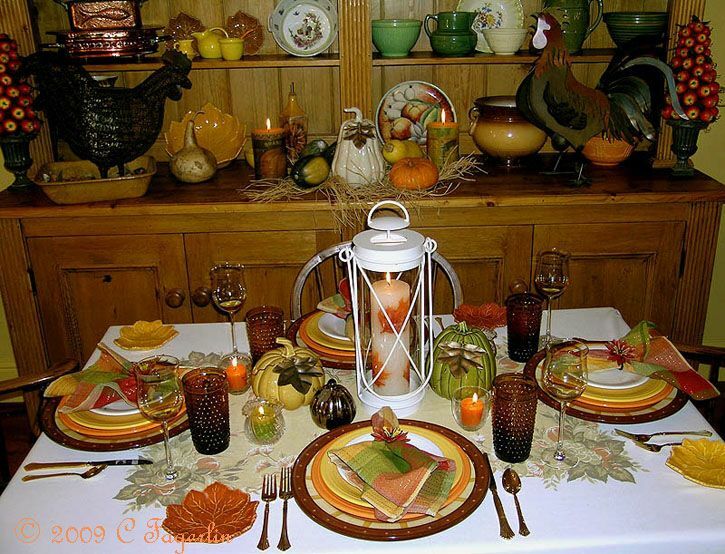 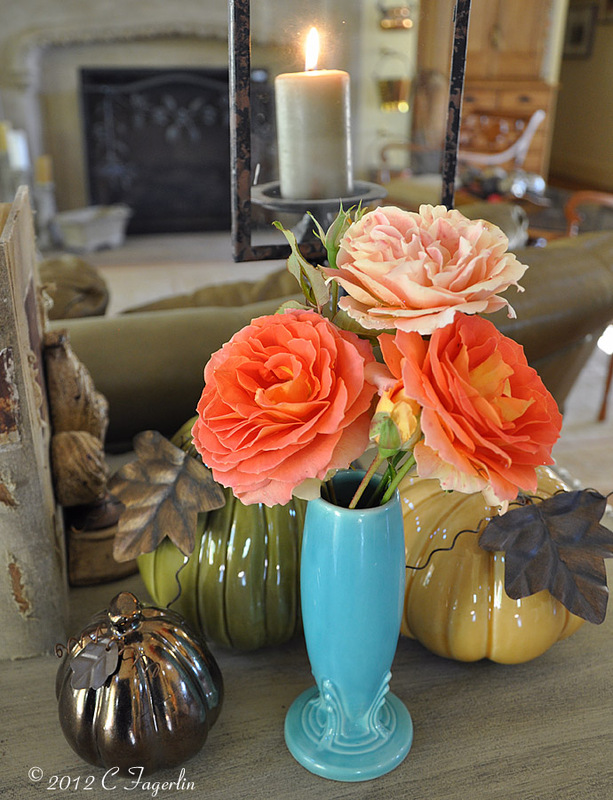 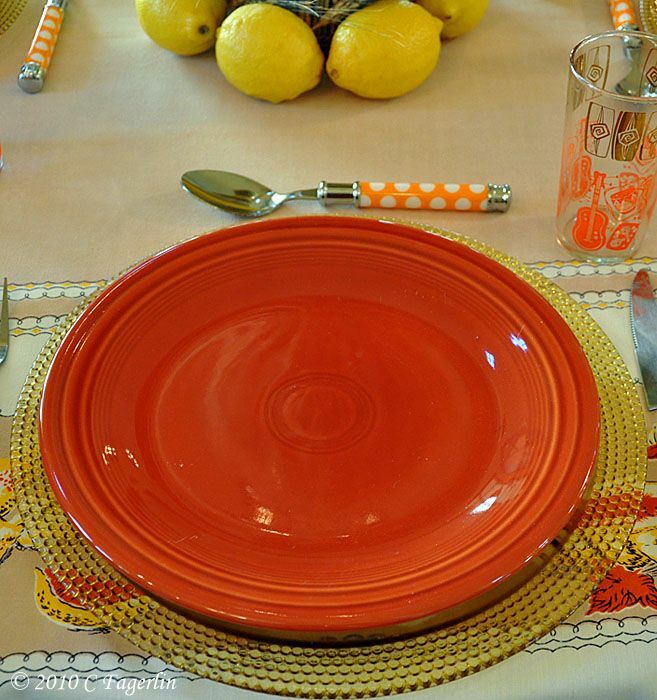 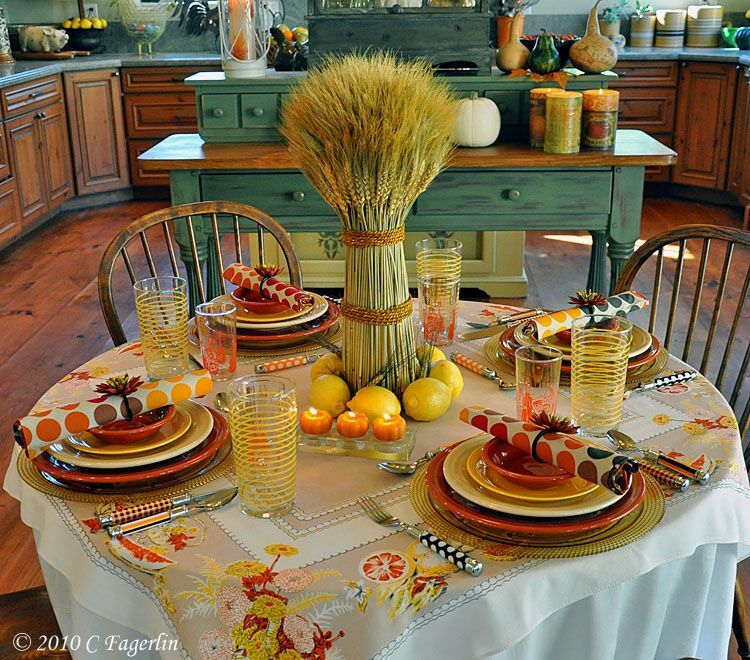 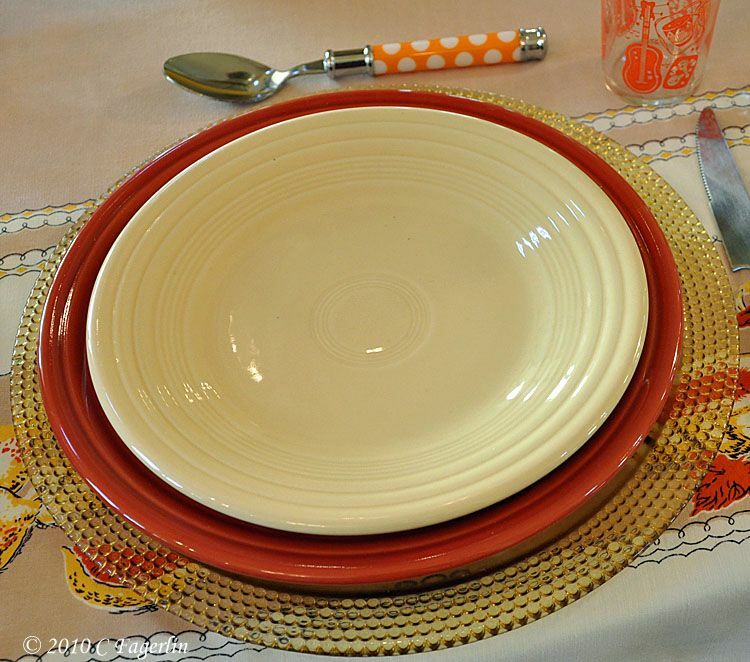 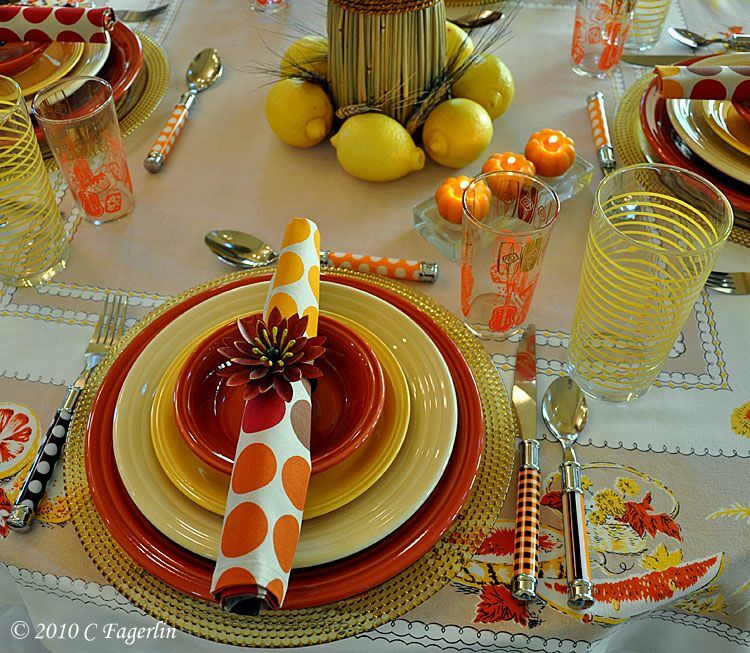 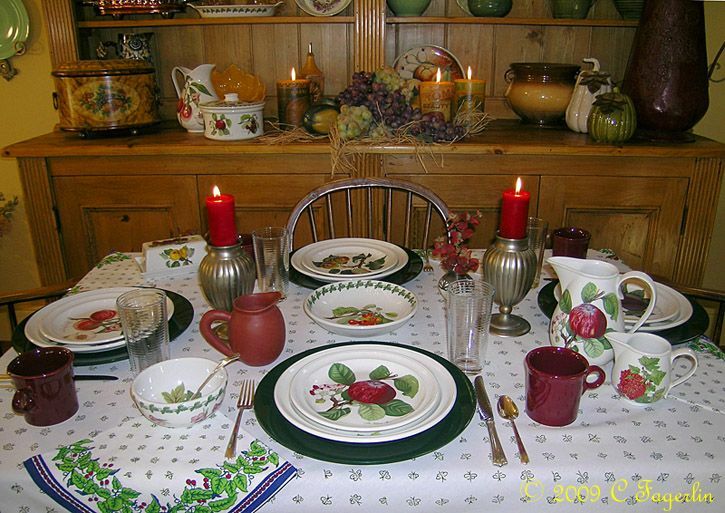 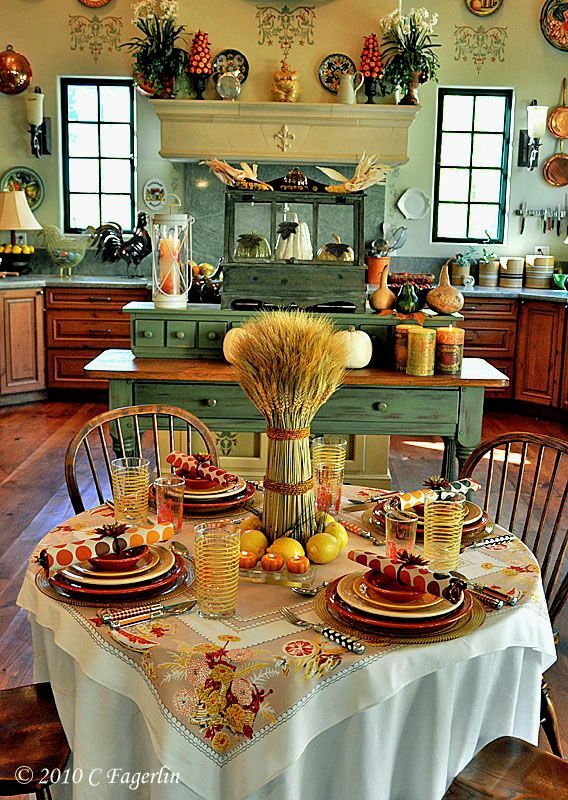 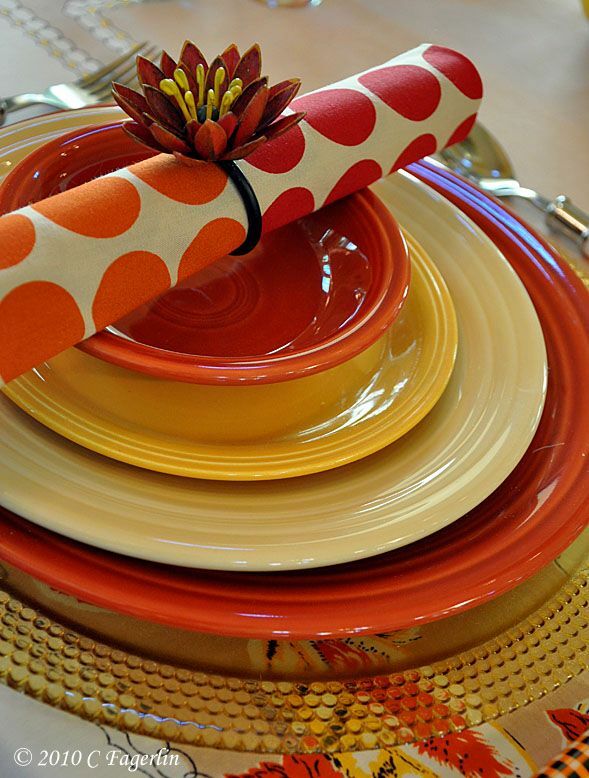 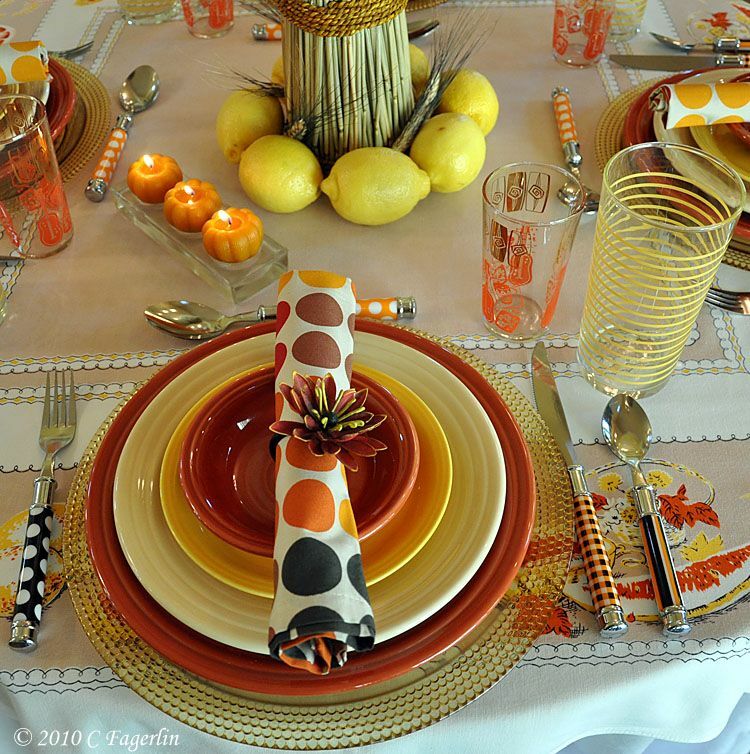 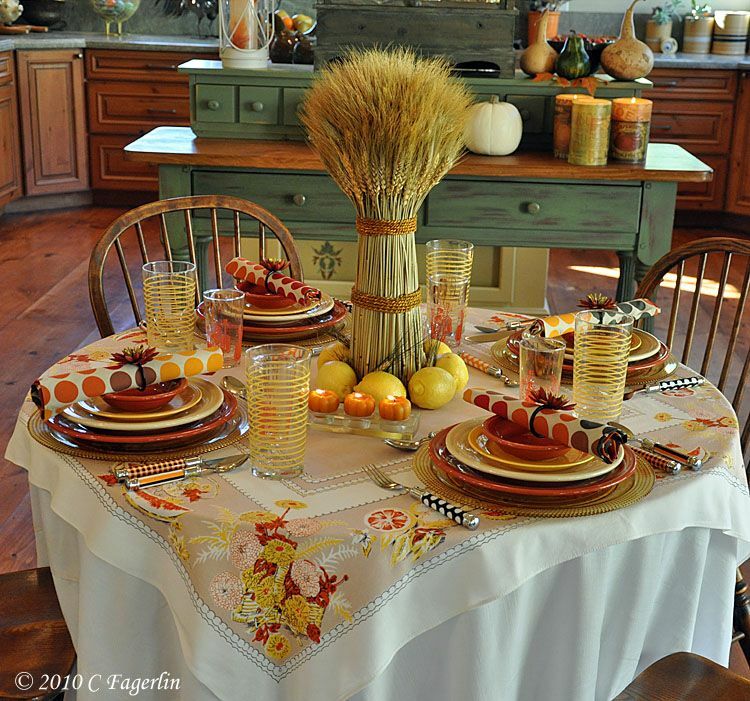 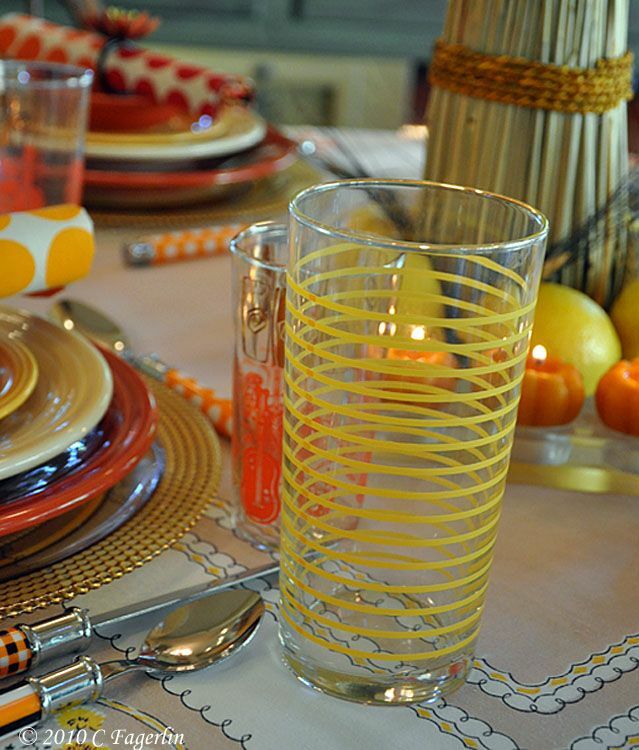 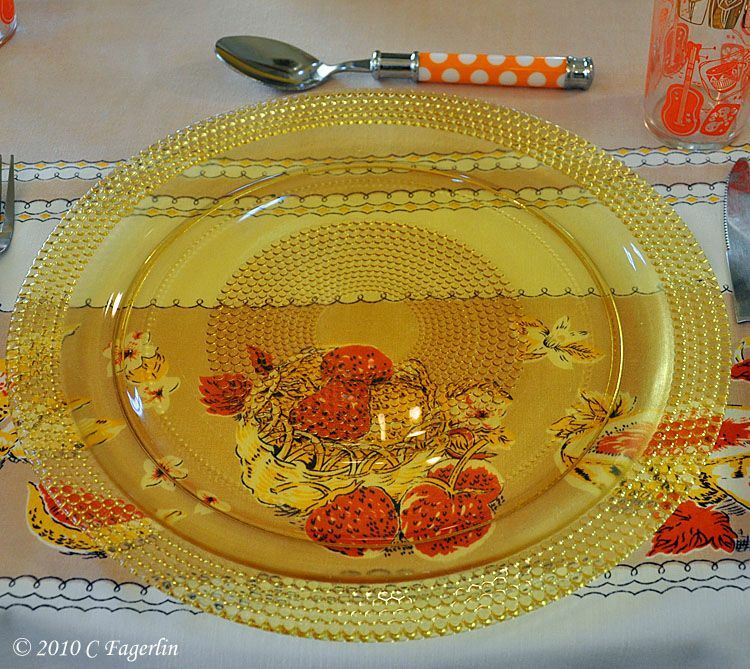 Looking back at some Thanksgiving tablescapes from past posts. 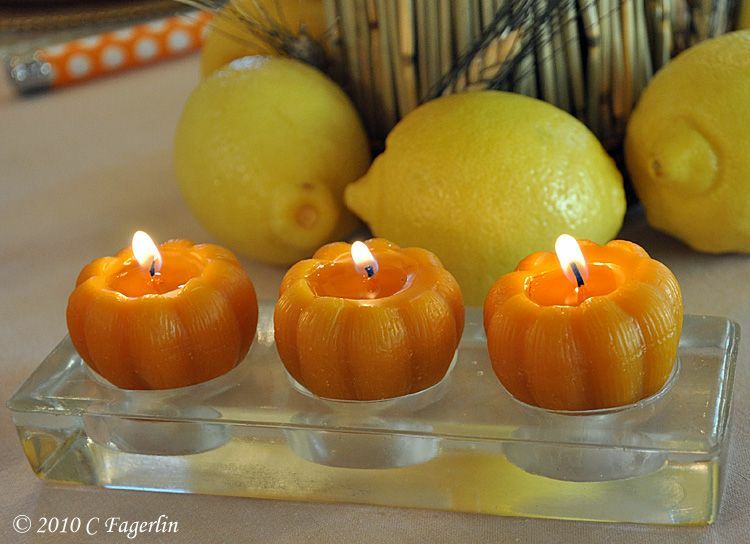 Have a wonderful relaxing holiday! 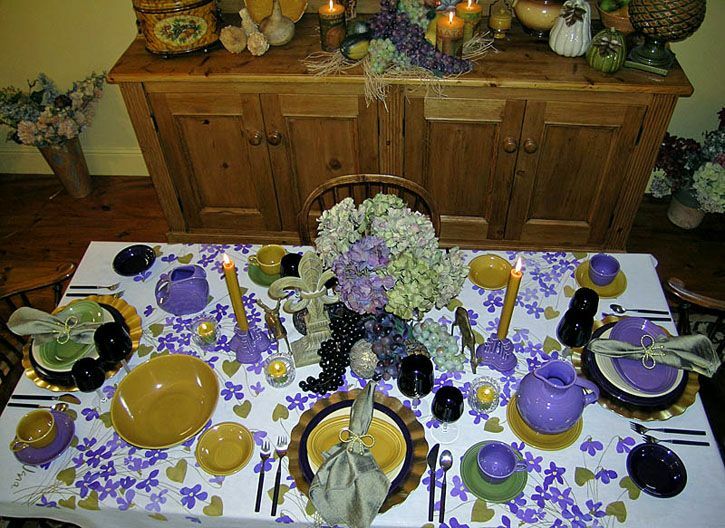 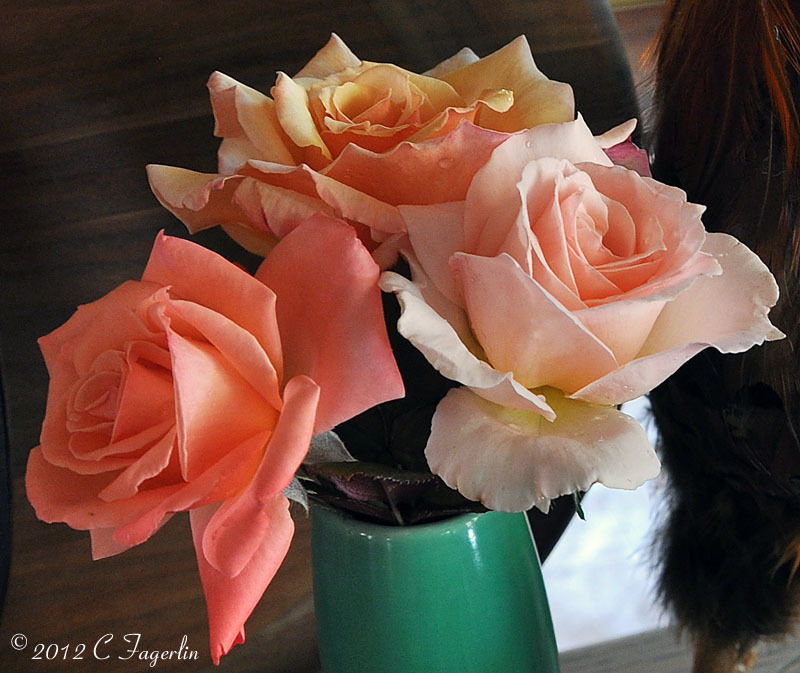 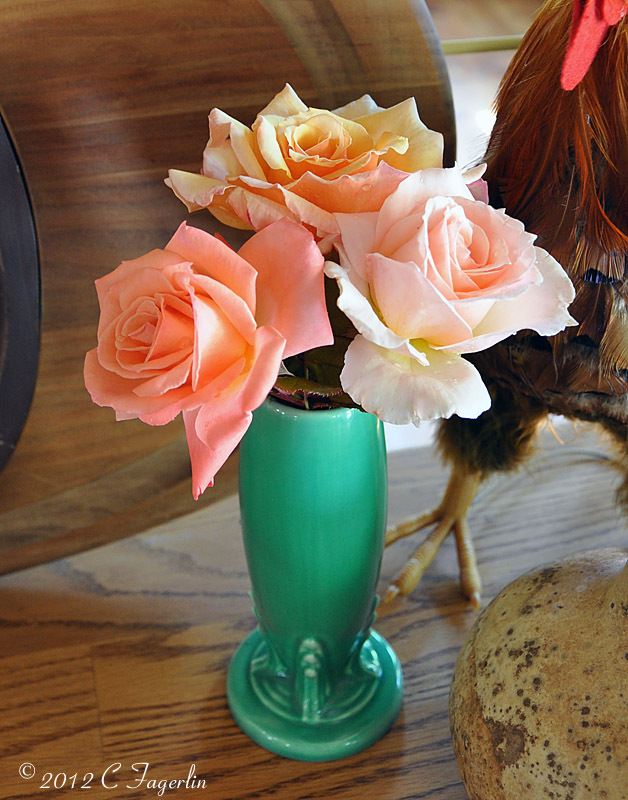 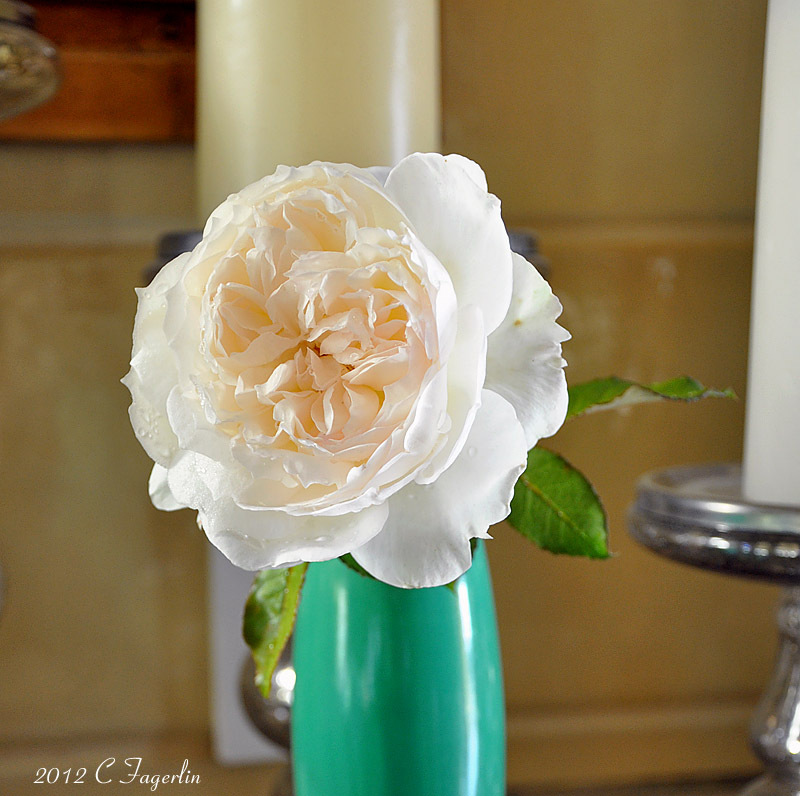 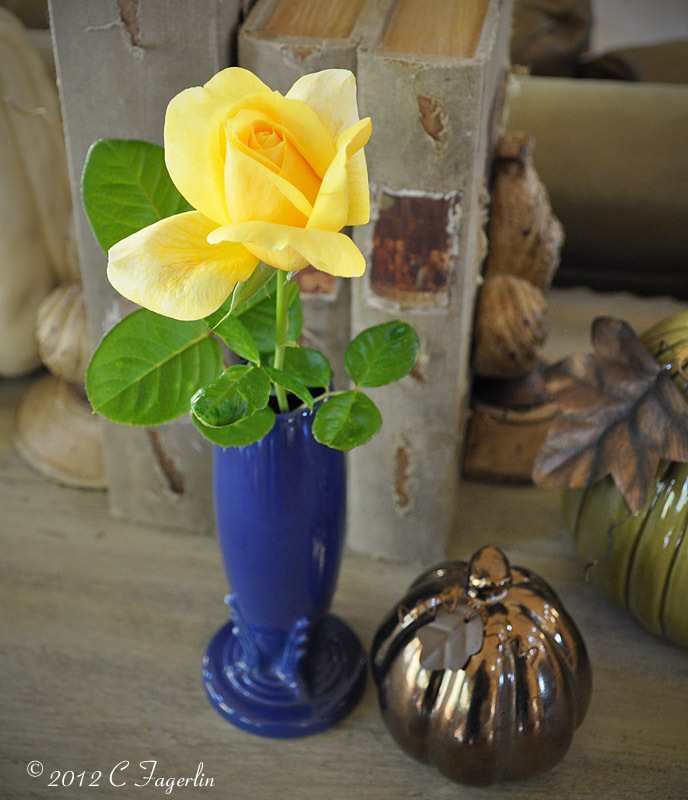 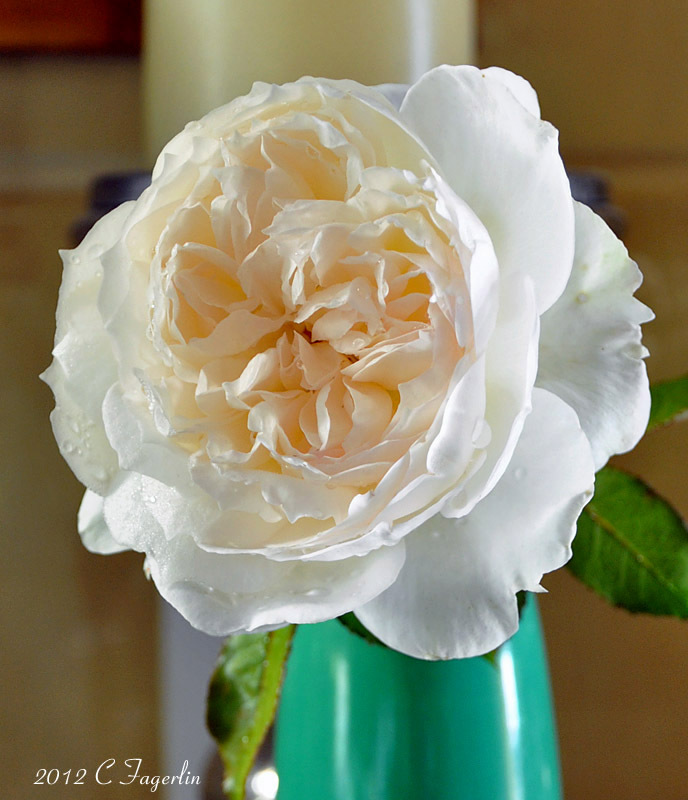 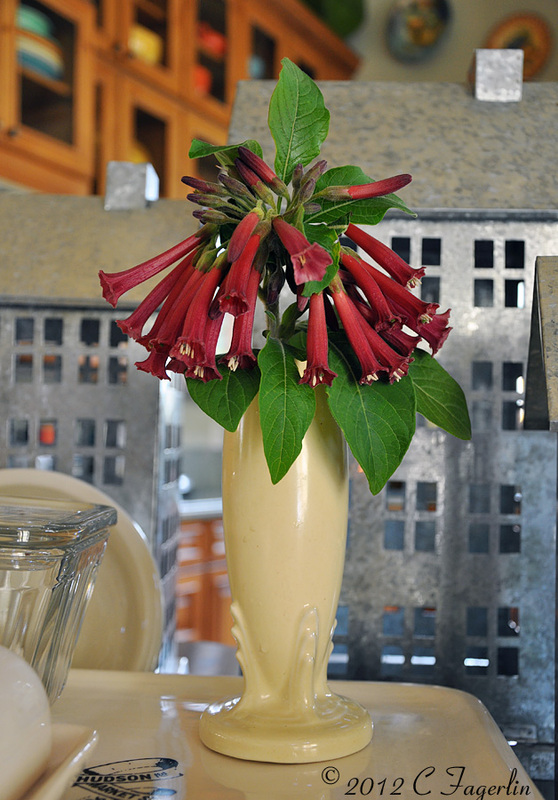 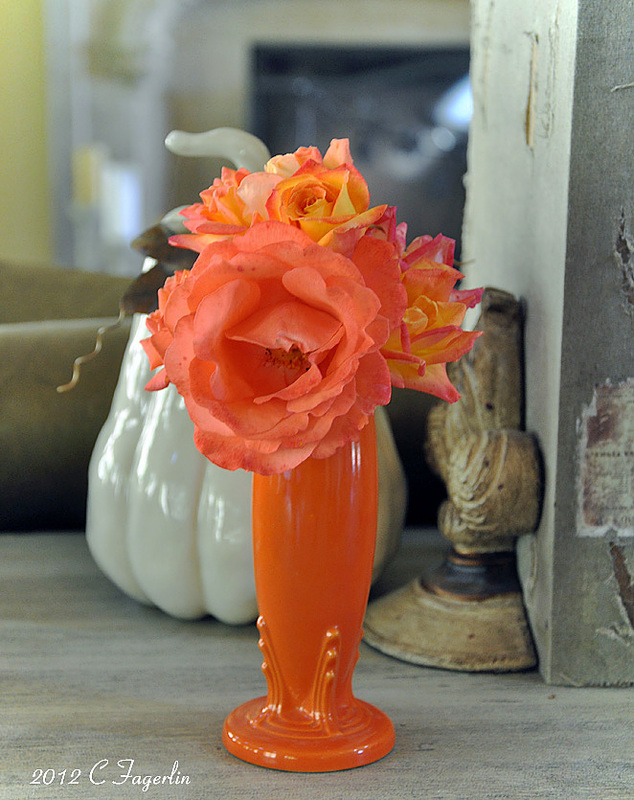 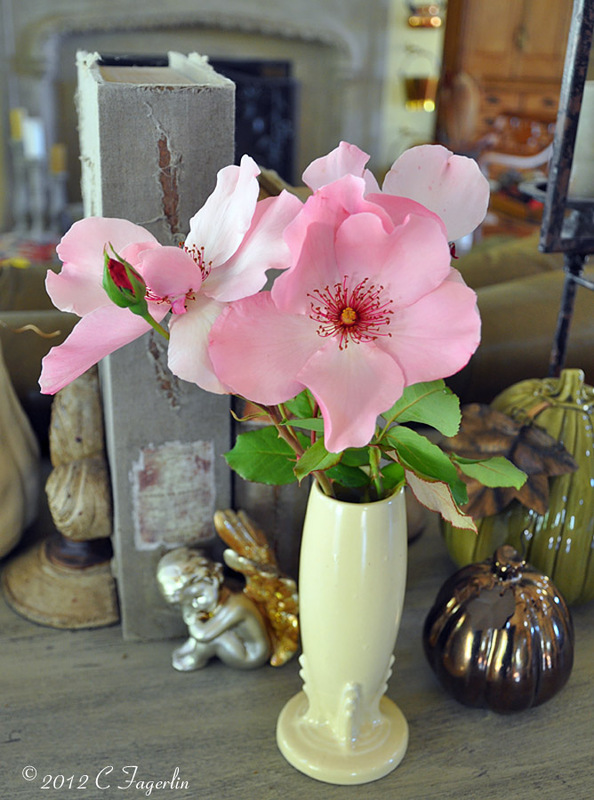 Click on each image below to view the full story on each tablescape. 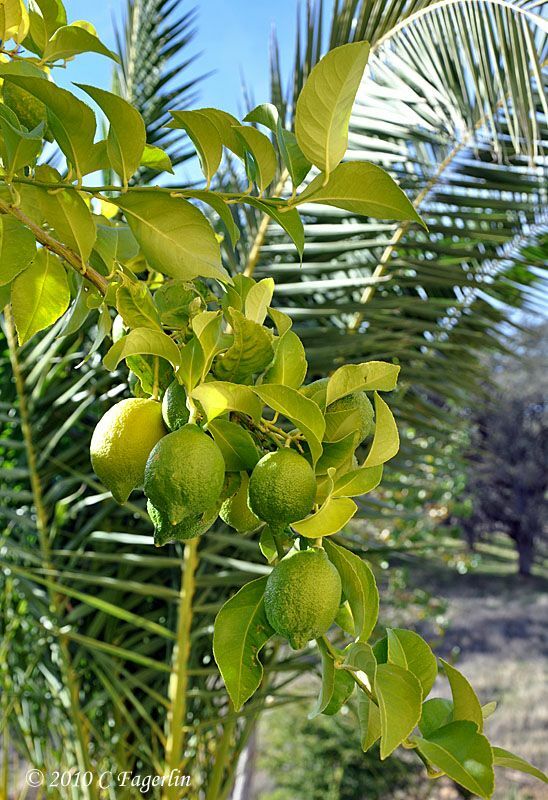 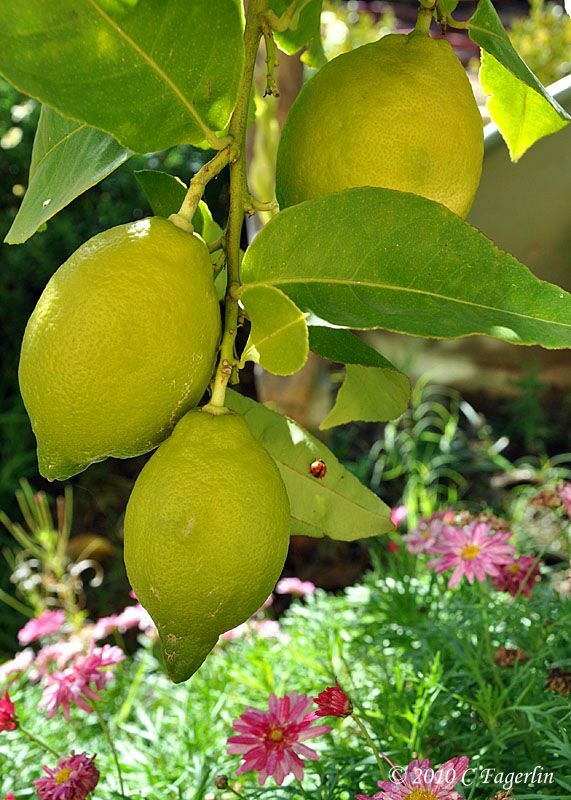 The latest crop of lemons is ripening in the late Fall sunshine. 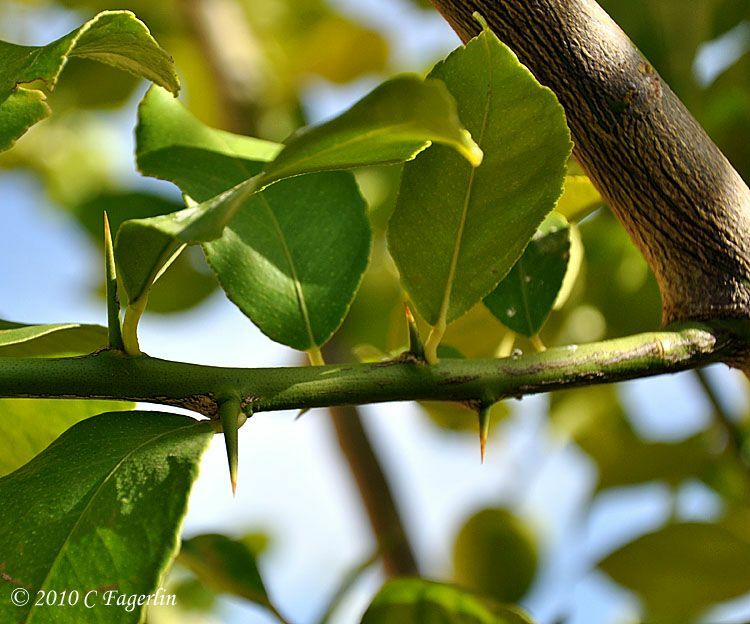 be careful where you reach, the thorns are wicked! 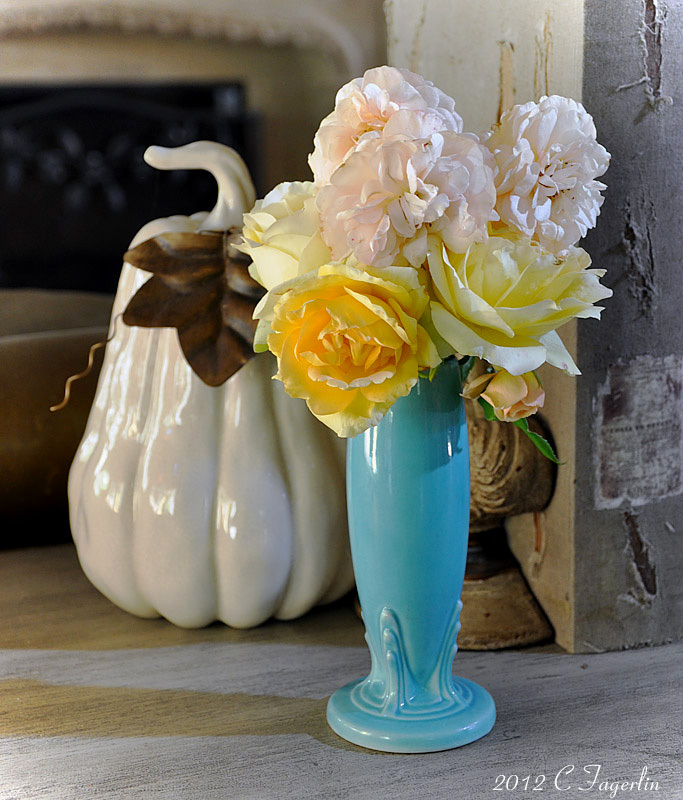 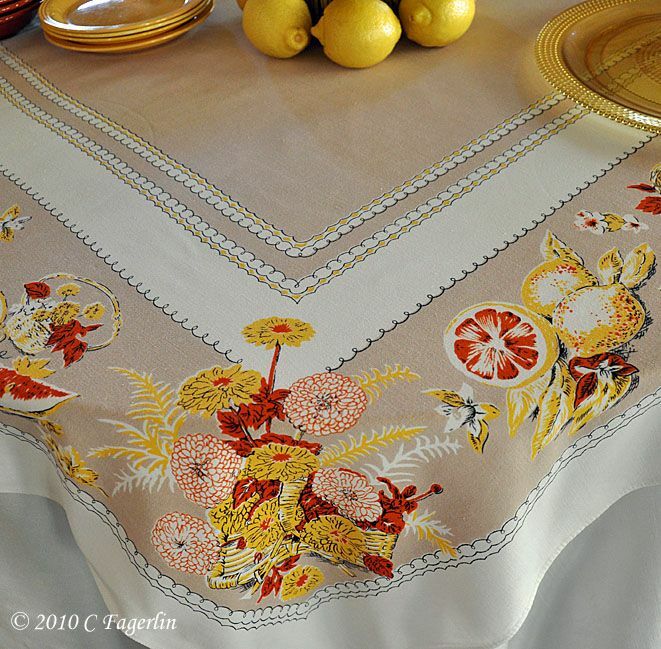 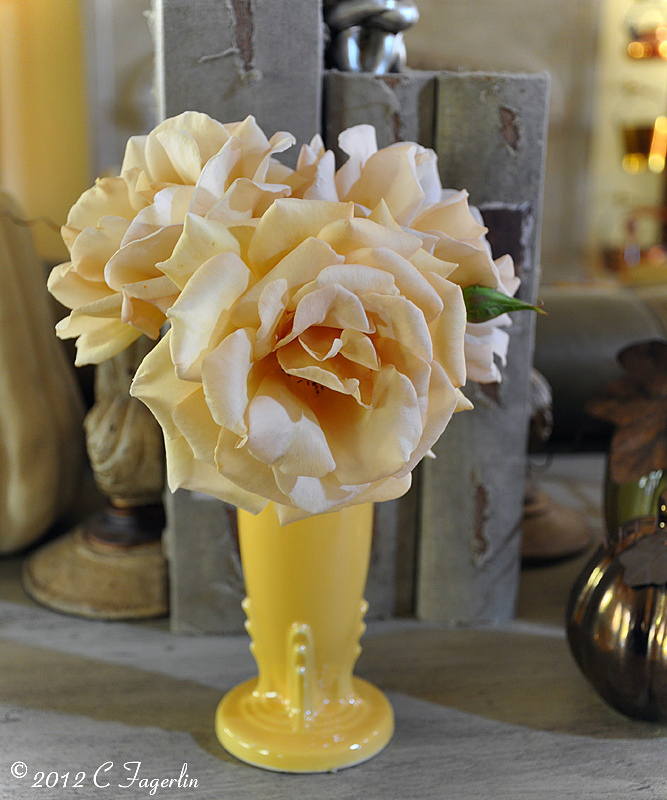 This vintage tablecloth fits right in with the lemon harvest, with it's soft muted Fall colors. 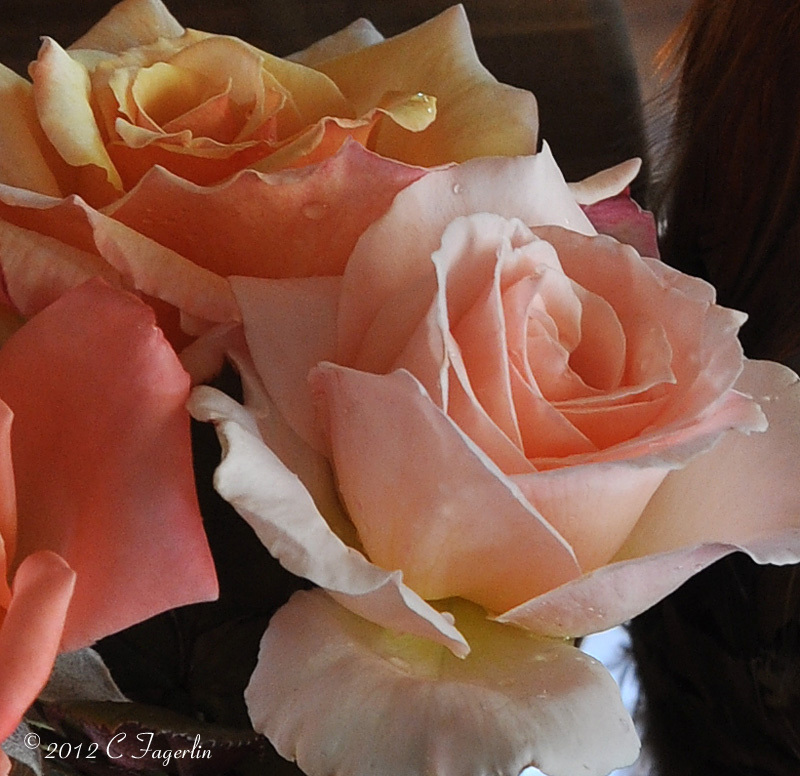 please come back again very soon.